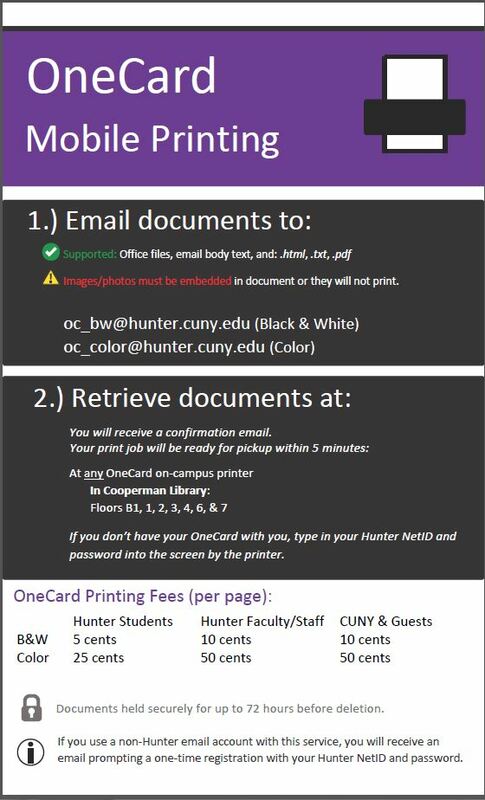 Current Hunter students, staff, and faculty now use their Hunter ID/OneCard to pay for printing and copying services. Patrons from other CUNY schools and visitors must purchase a GUEST card ($5 per card, contains $2.50 balance and is refillable) from an OneCard kiosk machine to print/copy. GUEST cards expire one year after purchase (even if there is a balance left on the card). **Other CUNY patrons, IELI students and Alumni can add money to their card as well. To print/copy, use your NetID when prompted. Manage your OneCard account at onecard.hunter.cuny.edu. If you don't have a OneCard you must purchase a Guest Card from the OneCard machines ($5 per card, contains $2.50 balance and is refillable). Add money to the OneCard, using cash at a Account Management Center (OneCard kiosk) machine in increments of $1, $5, $10, and $20. There is no fee for cash transactions at the kiosk, but a convenience fee of 3% is charged for credit card transactions and a minimum of $20.00 using online OneCard page. Read the OneCard Frequently Asked Questions (FAQ). For questions or concerns, contact: David Donabedian, Head of Access Services, 212-772-4176. New (Feb 2017): Currently enrolled students in fall and spring semesters will automatically get a dollar amount allocation each semester on their OneCard for printing only at any OneCard printer on campus. F/T students will receive $15 (300 pages * $0.05/pg) and P/T students get $8 (160 pages * $0.05/pg) on their card. No distinction whether Grad or Undergrad. Leftover balances do NOT carry over into the new semester.